POP Mat™ Medium Traffic Indoor Logo Mats are perfect for medium traffic, indoor applications. 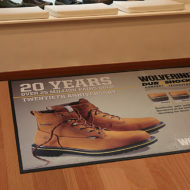 Produced in the USA from a needle-punch polyester fabric top with nitrile rubber bottom, these floor mats are digitally printed in full color with your artwork to help increase your sales when placed at entrances, in front of displays, or at the point of purchase. 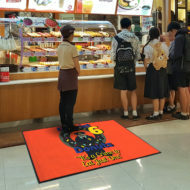 These floor mats are ideal for trade shows, retail stores, point of purchase displays, events, restaurants, convenience stores, banks, auto dealerships and more. Let’s promote your image! Order today! Includes Full-Color Digital Imprint of your Logo!